With lightened-up options, this can be eaten guilt-free! And the crump topping is out of this world amazing! Preheat the oven to 350 degrees F. Lightly coat three 5 ¾ inch mini loaf pans with nonstick spray. 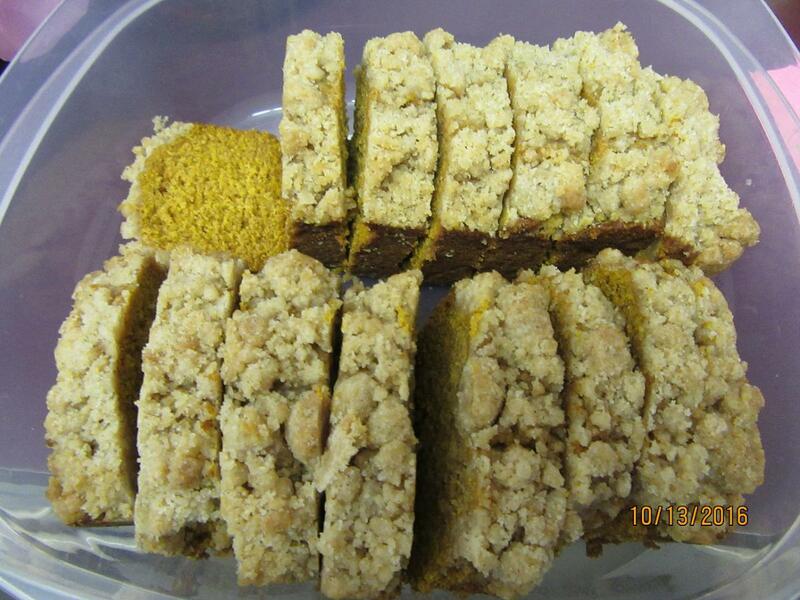 To make the crumb topping, combine flour, sugars, pumpkin pie spice and butter; set aside. In a large glass measuring cup or another bowl, whisk together pumpkin, coconut oil, butter, apple sauce, egg and vanilla. Place into oven and bake for 30-35 minutes, or until a tester inserted in the center comes out clean. Remove from oven and let cool for 15 minutes before inverting the cake onto a wire rack. It’s hard to believe, but some people don’t like pie. 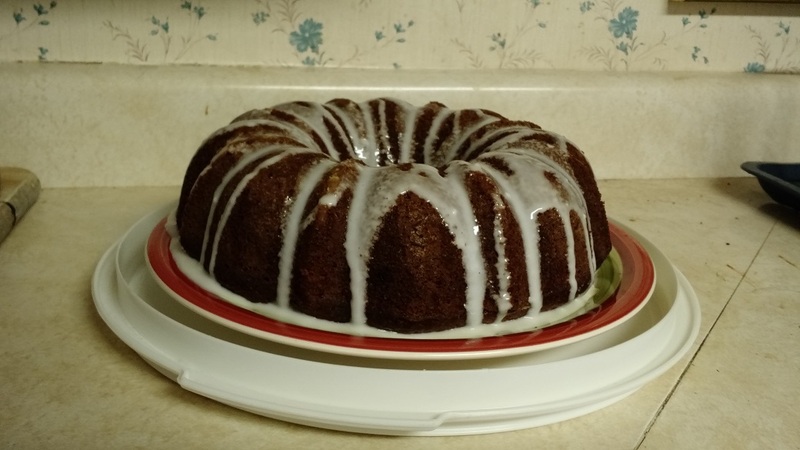 Let them eat cake with this yummy recipe from Nancy. Nutritional Information: Servings 20; Serving Size 1 slice (103g); Calories 340; Calories from fat 120; Total fat 13g; Cholesterol 75 mg; Sodium 380 mg; Carbohydrate 51g; Dietary Fiber 1g; Sugars 35g; Protein 4g. Preheat oven to 350 degrees. Grease and flour a large (12-cup) Bundt pan. For the Streusel, combine the brown sugar, CINNAMON and ALLSPICE in a bowl. Rub in the butter until crumbly with your fingers, or use a fork to cut it in. Set aside. For the Cake, in a medium bowl, combine the flour, CINNAMON, baking soda and salt. In a separate bowl, cream together the sugar and butter until light and fluffy. Add the eggs, one at a time, beating well after each addition. Add the pumpkin, sour cream, and VANILLA and mix well. Gradually add the dry ingredients and mix well. Spoon half of the batter into the prepared pan, trying to build up the sides slightly so the streusel won’t hit the pan edge. Sprinkle the streusel over the batter, trying not to let the streusel touch the sides of the pan. Carefully spoon the remaining batter on top, and smooth with a spatula. Bake at 350 degrees for 55-60 minutes or until a toothpick inserted in the cake comes out clean. Let cool about halfway on a wire rack 20-30 minutes before carefully turning the pan over onto the serving plate. Cool completely before glazing. For the Glaze, sift the powdered sugar into a small bowl, add 2 TB orange juice or milk and stir until smooth. Add more liquid as desired. Drizzle over the cooled cake. Cupcakes are to cake as these bites are to pumpkin pie. In other words, petite powerhouses. In a large food processor combine flour, butter, and cream cheese. Pulse mixture until dough comes together in a large mass. Remove dough from food processor and gently knead into a ball. Divide the dough into 24 equal portions (about ¾ inch balls). 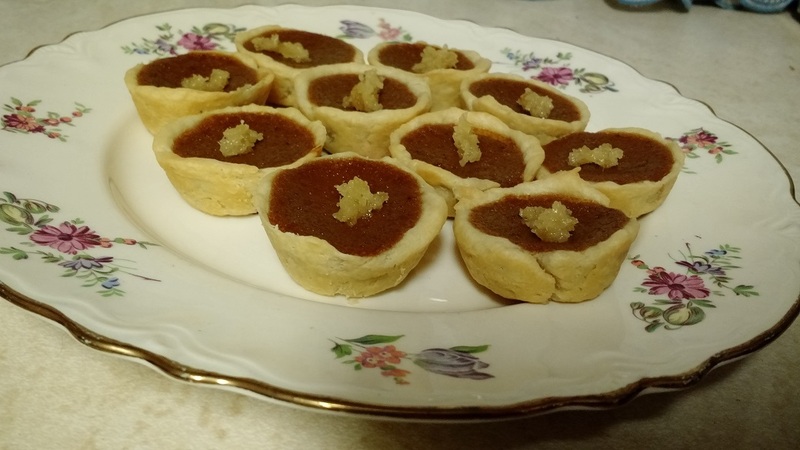 Using your fingers or a lightly floured tart stamp, press the dough into 24 ungreased mini muffin cups until bottom and sides are evenly covered. In a medium bowl combine pumpkin puree, egg, cream, brown sugar, cinnamon, ginger salt, nutmeg, and cloves. Spoon about 2 teaspoons pumpkin filling into each pastry lined cup. Bake 25 to 30 minutes or until filling is set and crust is lightly browned. Remove from oven and immediately sprinkle each cookie with a few small bits of crystallized ginger. Let cool in cups on a wire rack for 10 minutes. Remove from cups and cool completely on a wire rack. Place cookies in a single layer in an airtight container. Store in the refrigerator for up to 3 days or freeze for up to 3 months; thaw about 1 hour at room temperature before serving. This pie-inspired dip from healthy-dessert blogger Katie Higgins (chocolatecoveredkatie.com) is loaded with fiber and heart-healthy vitamin A. 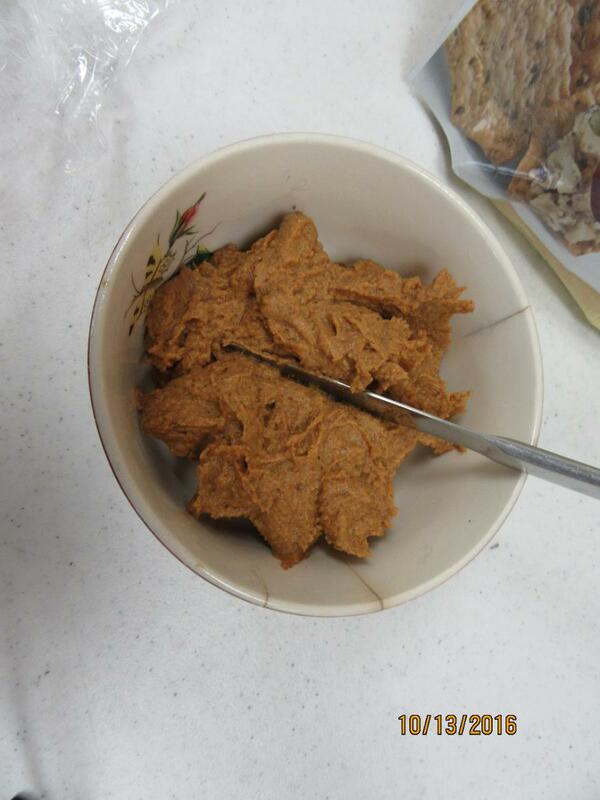 In a medium bowl, stir together pumpkin puree (not pie filling), almond butter, brown sugar, cinnamon, and salt. Serve with whole grain crackers or toast.